Larry J. Sabato's Crystal Ball » An Above-Average Year for Incumbents? An Above-Average Year for Incumbents? With the primary season more than half over, it’s fair to say that incumbents have done just fine this cycle so far: better than fine, in fact. So far this cycle, 273 of 275 House incumbents who wanted another term have been renominated, and 18 of 18 Senate incumbents. That includes results from the 31 states that have held their initial primaries; while a few of those states — Alabama, Georgia, and North Carolina — have runoffs coming up later this month, those overtime elections for House or Senate seats are all in open seats. This is a better performance than the postwar averages in both chambers. Since the end of World War II, just 1.6% of House incumbents who have sought another term were not renominated by their party, and just 4.6% of Senate incumbents. 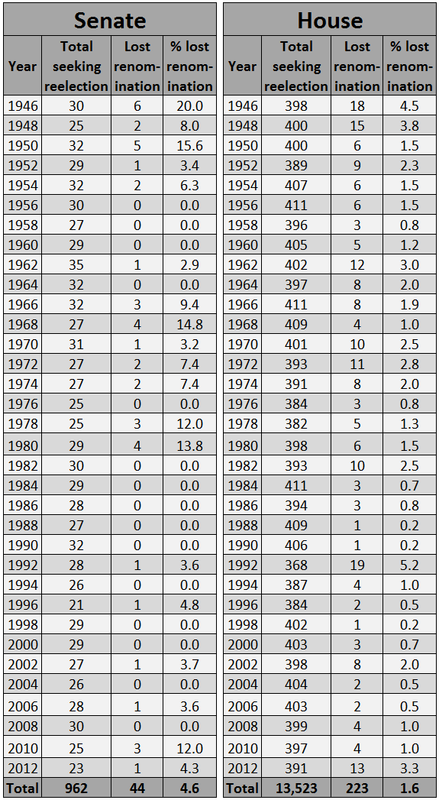 The history of incumbent primary losses in each election since 1946 is laid out in Table 1 below. Note: Click here for a PDF of these data. Anti-incumbent insurgents are going to have to hustle to even match the paltry postwar averages. So what are their best targets? Let’s look at the House, then the Senate. In the 19 remaining states, there are 127 House seats yet to be contested. In those states, 117 incumbents are slated to run for renomination and reelection. So that means 392 House members, as of this moment, have sought or are seeking renomination. Again, only two have lost so far: Reps. Eric Cantor (R, VA-7) and Ralph Hall (R, TX-4). To match the historical average in the House (1.6% of members running for reelection lose primaries), 6.3 of the 392 House members running for reelection this year would have to lose. Rounding the number down to six, that means four more in the 19 remaining states. If we remove redistricting cycles from the data (to take into account the large number of incumbents who lose renomination during these cycles due to new district lines and member-versus-member contests), just 1.3% of House incumbents fail to win renomination in non-redistricting cycles. To match that percentage, 5.1 (or five) of the 392 running again would have to lose renomination in this non-redistricting year, meaning three more incumbents have to lose this cycle to reach the average. It’s possible that this year will feature a below-average number of incumbent losses. But if this year equals or exceeds the postwar average, who is likeliest to lose? The next set of regular primaries takes place on Aug. 5, when four states vote: Kansas, Michigan, Missouri, and Washington state. Rep. Mike Pompeo (R, KS-4) is facing a challenge from ex-Rep. Todd Tiahrt (R), who unsuccessfully ran for the GOP Senate nomination in 2010. In the Wolverine State, two Republican congressman are facing different kinds of challenges: Rep. Kerry Bentivolio (R, MI-11), an accidental representative who won the seat after former Rep. Thad McCotter (R) didn’t qualify for the ballot in 2012, is facing wealthy foreclosure attorney David Trott (R); and Rep. Justin Amash (R, MI-3), a Paulist-style Libertarian, faces an establishment challenge from businessman Brian Ellis (R). Of these three, Bentivolio seems to be in the shakiest shape, and some of our Michigan sources are labeling him an underdog. Just two days later, in an oddly-scheduled Thursday primary, Tennessee will go to the polls, and there are a few races worth watching here. Rep. Scott DesJarlais (R, TN-4) has looked like a sitting duck for the whole cycle: The ostensibly pro-life, socially conservative doctor has a penchant for not practicing what he preaches. State Sen. Jim Tracy (R) is challenging the incumbent here, and he not only has the support of much of the state GOP establishment but also has much more money than DesJarlais. In Memphis, Rep. Steve Cohen (D, TN-9), despite some odd personal behavior, has beat back several primary challenges in this majority-black seat (Cohen is white). He faces another challenge this time from attorney Ricky Wilkins (D), but there’s not much indication that Cohen will lose. Finally, Rep. Chuck Fleischmann (R, TN-3) is again facing a primary challenge, this time from Weston Wamp (R), a 2012 Fleischmann challenger and son of former Rep. Zach Wamp (R), who ran unsuccessfully for governor in 2010. Fleischmann remains a favorite. Two other incumbents to watch are Rep. John Tierney (D, MA-6), who probably has a sterner challenge waiting for him in the general election against 2012 opponent Richard Tisei (R) than he does in the primary, and Rep. Vance McAllister (R, LA-5), the “kissing congressman” who won a special election last year, admitted to infidelity and decided not to run again, and then recently jumped back into the race. Voters will decide whether McAllister’s mistake disqualifies him from office. Remember that Louisiana doesn’t really have a primary: All candidates run on Election Day in November, and if no one gets 50% the race goes to a Dec. 6 runoff. If McAllister misses out on a runoff, that would seem akin to an incumbent losing a standard primary. Of course, sometimes primary upsets come out of the blue. Left unmentioned here is Florida, where all 27 incumbents are running for renomination on Aug. 26. The victory by Rep. Ted Yoho (R, FL-3) over former Rep. Cliff Stearns (R) was one of the big shocks of primary season two years ago, but there aren’t any obvious candidates for an upset this time. The bottom line is this: In order for the number of House incumbent losses to match the postwar average, four more members will have to lose. That would require several of the members mentioned above losing, or perhaps an absolute shocker or two. This is possible, but far from probable. Incumbent perfection in the Senate? We are still waiting for an incumbent senator to lose renomination this cycle. Of 36 races (33 regular contests plus three special elections) coming up this November, incumbents are running in 29 contests. Those incumbents are a perfect 18 for 18 so far, with the only truly close call coming in Mississippi, where Sen. Thad Cochran (R) survived a dramatic runoff (though his opponent, state Sen. Chris McDaniel, hasn’t given up yet). In order to essentially match the postwar average of 4.6% of Senate incumbents who sought another term losing renomination each cycle, 1.3 of the 29 incumbents — just one, rounded down — would have to lose. But all the remaining incumbents in the 11 contests left to go are at least small favorites from here on out. Probably the likeliest Senate incumbent loss would come on the Democratic side, where appointed Sen. Brian Schatz (D-HI) faces a challenge from Rep. Colleen Hanabusa (D, HI-1). Gov. Neil Abercrombie (D) appointed Schatz to the seat following the death of Sen. Daniel Inouye (D), even though a deathbed letter indicated that Inouye wanted Hanabusa to get the appointment. Schatz is better funded and has the endorsement of President Obama, and we consider him a very slight favorite. But this is a close race. Given the intense focus on internecine Republican primary battles, it would be fascinating if the only Senate incumbent to lose a primary this year was a Democrat, albeit an appointed one. On the GOP side, probably the most endangered remaining incumbent is Sen. Pat Roberts (R-KS), who has benefited thus far from his opponent, physician Milton Wolf (R): The most notable story about Wolf is that he used to post gruesome X-rays on Facebook and make snarky comments about them. That said, Roberts faces questions over his residency — he primarily lives in Northern Virginia and basically does not have a home in Kansas, though he is eligible to run for reelection — and it’s fair to wonder whether Roberts still has his political fastball. Just a few days ago, Roberts was asked during a radio interview about his residency. His reply contained a seeming Freudian slip: “Every time I get an opponent — I mean, every time I get a chance, I’m home.” A few months ago, this race seemed over, but it isn’t with a month to go. In Tennessee, Tea Party activists would love to knock off Sen. Lamar Alexander (R), but his main challenger, state Rep. Joe Carr (R), hasn’t really gotten much traction. Keep watching the race for an upset, but Roberts or Schatz losing seems likelier. Overall, a perfect renomination record for Senate incumbents this cycle is within reach, which would be the 16th time in 35 post-World War II regular election cycles where every Senate incumbent who wanted another term was renominated. Forgive us for being a broken record on this point, but it’s still very beneficial to be an incumbent in a congressional election, particularly a primary. — Geoffrey Skelley contributed to this article.